Having fleshed out their case lineup from top to bottom, Corsair is starting to show some of that old experimental spirit again. The Obsidian 350D turned out to be one of the best micro-ATX cases I've ever tested, and the Carbide Air 540 will actually be showing up in a future article as the case of choice for a very specialized build. Now, with the new Carbide 330R, Corsair has created a variant on the Carbide 300R designed to offer silent performance for end users who aren't ready to spend up on the splashier Obsidian 550D. The competition at $99 is tough, though, especially for users who want a silent enclosure. Corsair has to contend with the intermittently available Nanoxia Deep Silence 1 and 2 along with Fractal Design's Define lineup. 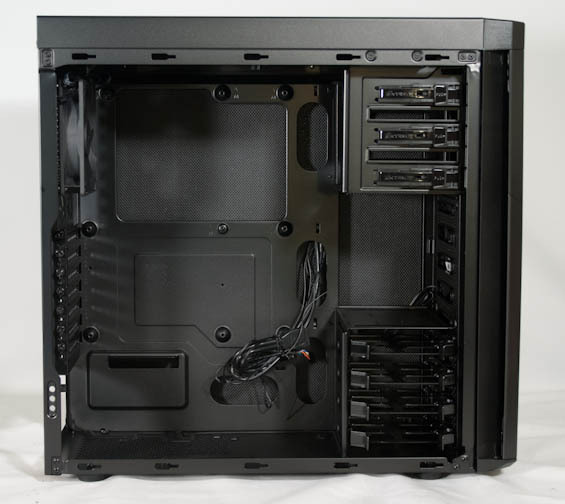 Silent computing is a tough racket to break into; while the 550D was a solid enough option, it continued to suffer from the iffy air cooling thermal performance that has plagued many of Corsair's designs (excepting the stellar Carbide Air 540). The 330R adopts the internal framework of the Carbide 300R but changes some of the exterior, extracting additional mileage out of a fairly solid design. The front fascia is replaced by an acoustically padded door, but there are gaps around where the door closes that allows plenty of air to travel into the enclosure. 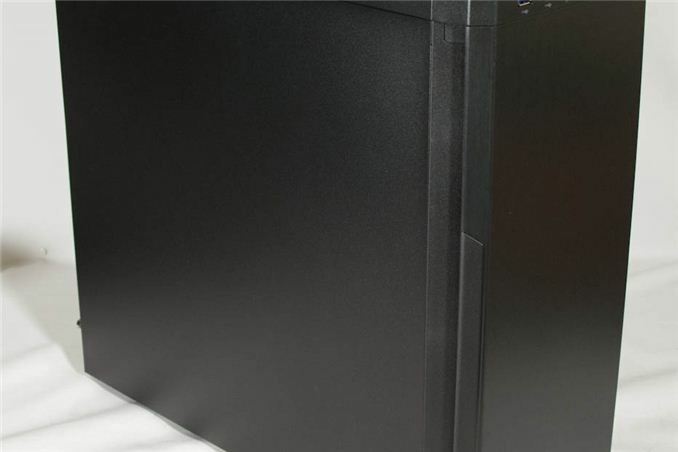 Meanwhile, the side panels are both solid and feature acoustic padding, and the ventilation on the top of the case is covered by a snap-in shield that allows you to choose whether you want to close off the top and prevent noise from escaping or employ up to a 280mm closed loop cooler. As I mentioned, the interior of the Carbide 330R is basically the same as the 300R, just with acoustic padding added where appropriate. There's a fine enough balance struck in expandability, and Corsair's commitment to making the case as easy to assemble as possible is evident as there's a stud in the middle of the motherboard tray for aligning the motherboard; no standoffs need be installed, either, as the tray itself has standoffs built into it and extruded. Drive Bays External 3x 5.25"
Dimensions 19.49" x 8.27" x 19.06"
Interestingly, Corsair doesn't include any kind of fan control, opting instead to include a pair of low noise 140mm fans. 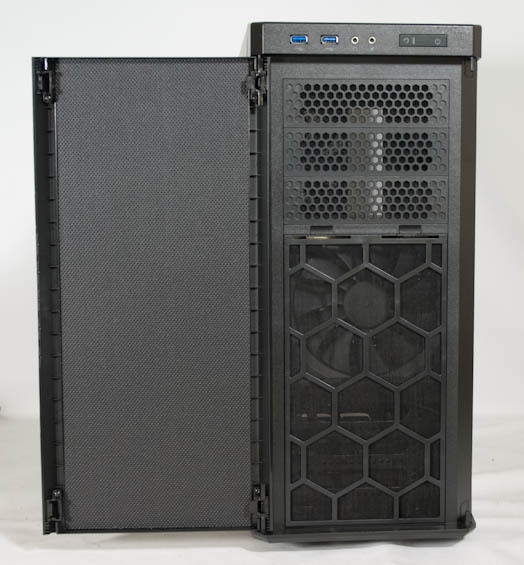 You'll see later that they do manage to keep noise levels down, but at the risk of spoiling the results, the overarching trend with computer cases continues to be "Silence, Performance, Price: Pick Any Two." I'd love to see how these cases do with a more focused quiet build - I used a Fractal Define Mini on my last build (OC'd i7/670/SSDs only/AIO water/fanless PSU) and without too much effort or compromise have a near silent machine under any load. Would be interesting to see how such a build would work in the various cases. I don't understand why the inverted motherboard design hasn't been more widely adopted. The "standard" ATX tower design seems pretty dumb: you've got the CPU cooler in a dead spot behind the optical drives (with no airflow from the intake fans), and one of the two front intakes is largely wasted by blowing at the back end of the PSU. If the motherboard is inverted, you've got both intakes blowing directly over the motherboard, providing extra cooling to the CPU and video card(s). This seems like a no-brainer, so why do most companies stick to the old ways? I think it is a semi-myth. Inside of the case, once the air is heated up it should never slow down enough to be affected by convection, but rather the GPU/CPU fan should move directly to the closest exhaust fan. But outside of the case, the exhausted air still needs to be removed so it can't flow back to the intake. What works here depends on where you place your case. If it is under a table, top exhaust might be just reflected down. If it stand besides a table, with the back to a wall, top exhaust is the more efficient option, as convection will set in as soon as the hot air is hanging over the case.